Ava’s use of the wicker loveseat has rendered it useless for human seating. To be fair, the chickens had already started the disintegration by pooping all over it in the girls’ corncrib “club house”. So I’m trying to convince my dad that his new hobby should be building me porch furniture. 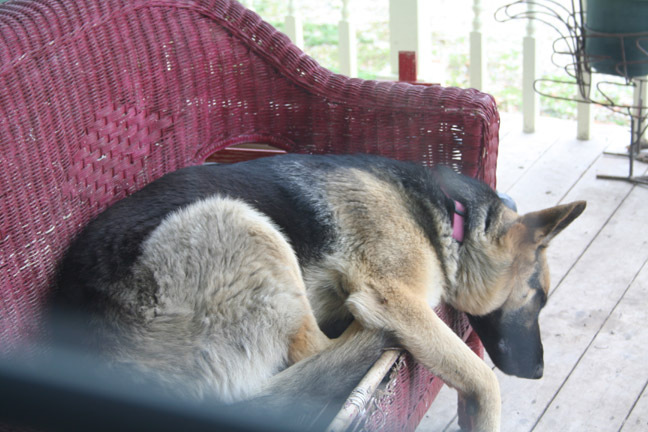 Dog-proof porch furniture. Ava has really grown since this picture! what is that curious looking wire thing past the dog *just above her head*? Looks like a wire rooster flower pot or something. Looks pretty comfortable to me.